News > Events > ET October/November is here! This issue thinks big. 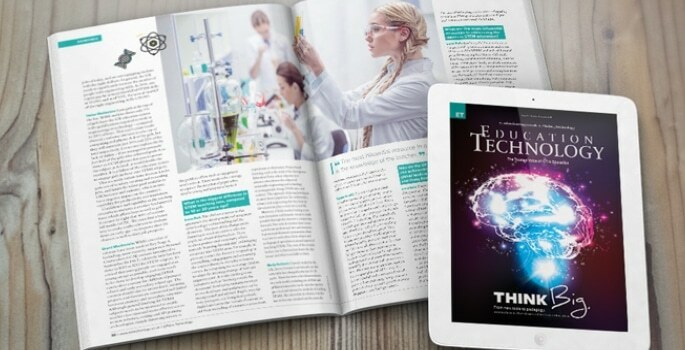 From blended learning to MOOCs, we look at how the education system in the UK is utilising the best in tech to push the boundaries of teaching and learning. Whether focusing on edtech tools or pedagogy, educators also need to consider what the student of today looks like, and how to tailor the education they provide to allow for the best results. We have an insightful opinion piece on this topic from the CEO of FutureLearn, Simon Nelson. As always we’re also bringing you all the latest news from the primary, secondary, and HE sectors, including a UK exclusive on the launch of a brand new app that gets students out and about in their local area, and news from Oslo-based start-up No Isolation on their AV1 robot that connects sick children to the classroom environment, remotely. Don’t forget to catch up on our new Editor’s Picks of all the best tools and services on the market at the moment, as well as the return of our international news page. All this, and lots more inside the mag!